British based William Mitchell Calligraphy has been designing and manufacturing exceptional pens for almost 200 years. Renowned worldwide for their quality, their pens are the first choice for professional calligraphers, scribes and aspiring students. This calligraphy starter set contains a cartridge pen which is ideal for the popular writing styles of Italic, Roman Round Hand, Uncial and others. It comes with three smooth writing nibs, 1.2mm, 1.4mm and 1.8mm and 4 cartridges. 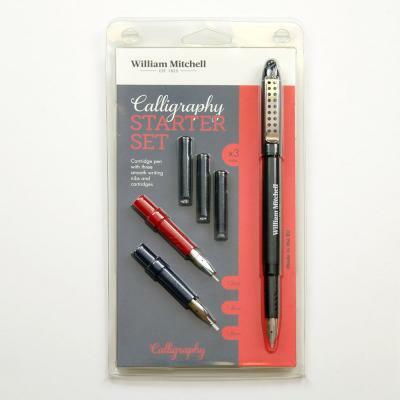 See more calligraphy products here.